3/31/2016 | Weekly Highlight: TSUJI Kyo — dai ichi arts, Ltd.
Tsubaki, or the camellia flower, is native to Japan and grows from Okinawa to Aomori-almost throughout the country, with the exception of Hokkaido. This evergreen shrub can be seen in many Japanese cities, growing in gardens or planted in rows along the sidewalks and roadways, and its many varieties add color and beauty to these bustling cityscapes. The large camellia flower blooms in winter surrounded by hardy dark green leaves. It has grown in popularity among Japanese households ever since Toyotomi Hideyoshi (豊臣秀吉) began to use the Tsubaki flower for his tea ceremony in the 16th century. Traditionally, tsubaki decorations can be found in many tea houses and hotels, second in popularity only to the cherry blossom. This love of the tsubaki plant does not stop at flower arranging, however, as its ash also contains high levels of aluminum used for Sake making and natural dyeing. 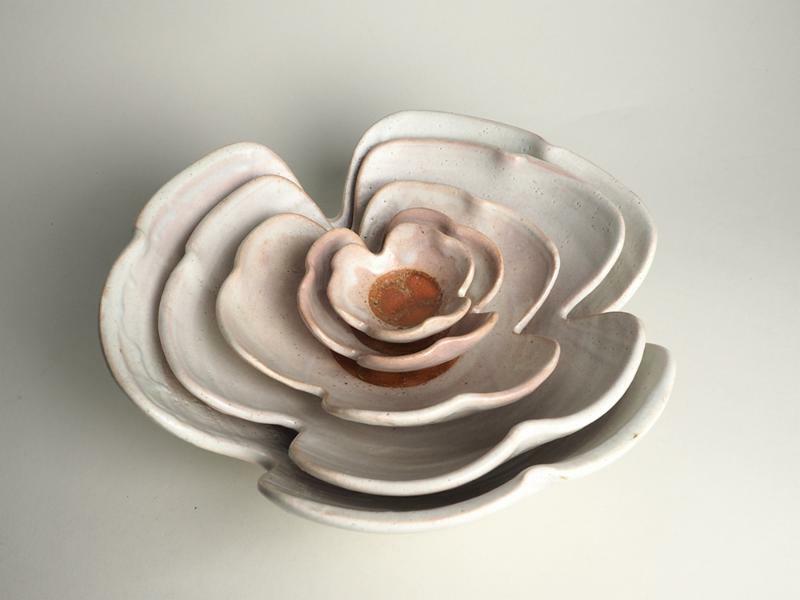 Tsuji Kyo, (1930-2008) a pioneering female artist who has drawn formal inspiration from nature throughout her career, has here created glazed Rose Camellia nesting bowls (白椿釉入子 玉椿) that sing the song of tsubaki. These bowls capture the shape and essence of the flower in a beautiful set that, when nested, resemble the layered petals of the camellia bloom. She has created this hardy flower in Shigaraki clay, with a coating of camellia wood ash glaze that leaves the center of each flower open to the red-orange of the earthy clay. Kyo is the most original artist to have found inspiration from the traditional camellia flower form, and these bowls are a true testament to the simple beauty of this native Japanese flower. san's Shigaraki clay is soft and beautiful, lovingly tended and formed into gorgeous works of art. Here, we also see a molded diamond-shaped bowl that has been fired to give a soft, silk-like surface, as well as amixed-clay (neriage) bowl. In this, the two clays interact, dancing around one another in flowing veins that twist across the surface. These bowls, along with the camellia nesting set, prove that Kyo is not done with ceramic innovation, and continues to produce stunning works that speak to her own sense of the beauties of nature.